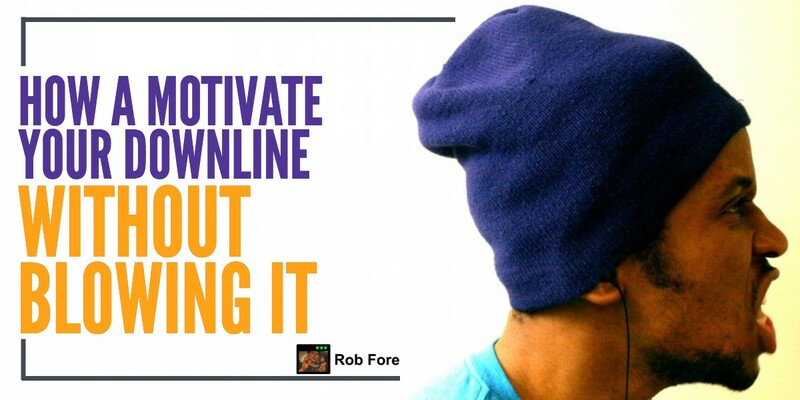 One of the most common questions I get asked from new, emerging leaders in network marketing is how to motivate their downlines to take action. “I must be doing something wrong because I’ve signed up 18 people and no one is doing anything. I call, I send encouraging notes, recommend training materials, chat about their dreams and goals and… nothing. I even paid for training materials out of my own pocket. It’s a fair question because the MAGIC of network marketing is the promise of amassing a personal fortune by leveraging the time, talent and energy of lots of people. Lots of people each doing a little bit. Not one person doing everything. So when your downline doesn’t get busy, when your downline doesn’t take action, when your team members just don’t seem as serious as you… is there any way to light a fire under their butts to take action? Unfortunately, no. At least not in my experience. members than they want for themselves. You can lead them to the starting line, but you can’t run the race. You can support them with training materials, live opportunity calls, coaching, lead capture pages and even encourage them to participate in company sponsored events to get the big picture… you can root them in fertile ground… but you cannot make them grow. Leaders always reveal themselves and if no one on your team is stepping up to the plate to at least swing at the ball… the best thing you can do is go build a new team. Plain and simple. Stop trying to MANAGE your current team. Those who want success will take action. They will call for advice and counsel. They will make sacrifices. They will invest in their own training. They will attend events and company calls. They will pester you like crazy for the first 30, 60, 90 days and then you’ll hardly hear from them BECAUSE they have stepped into a leadership role and are too busy building their businesses. The sad reality is 85-90% of the people you introduce to this wonderful industry called network marketing will never do anything. Another 5-8% will sponsor a half dozen new team members, wait for them to make them rich, get discouraged when it doesn’t happen and quit. So we’re left with 3%. These are the people who are committed to producing a result no matter what. Your leaders. And if no one has revealed themselves as a leader on our current team – go build a new one. than it is to resurrect a dead one.